Happiness Is An Old Set of Polyhedral Dice! Which brings us to the topic at hand: dice. The day before yesterday, Reis over at Geek Othodox put up a post extolling the virtues of his new dice, and describing the joy he derived from them: "Happiness Is A New Set of Polyhedral Dice!" He also questioned whether it was weird to buy dice for a specific character. Well, I don't think I've met a gamer yet who wasn't also a dice whore. It's an affliction from which we all seem to suffer, so I can totally understand where Reis is coming from. Okay, so they're not the Zocchi dice so many old-schoolers seem to love (but for which I never had much liking - the truth's out!). 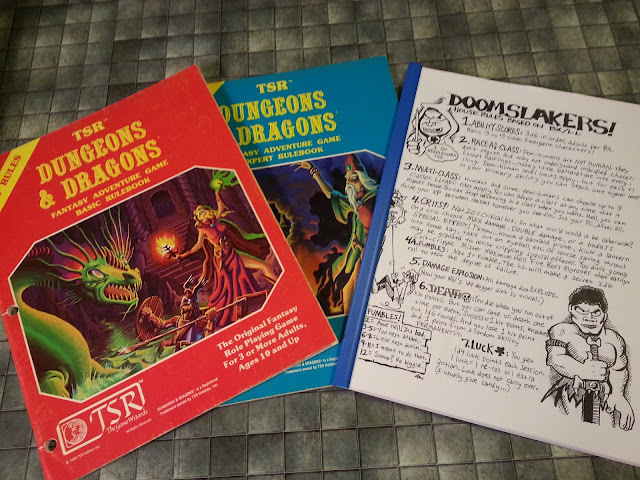 In fact, it seems that many of my fellow "OSR" bloggers seem to revile the dice that were packaged with the Moldvay/Cook sets. Not me, though. I love 'em. Holding a set of these in my hand induces post-traumatic stress-like flashbacks to my younger years. It's a kind of nostalgic rush that can seldom be matched. It was a combination of the listed condition of the rulebooks (amazing - no yellowing, no old-paper smell, only a little staple rust in one of the books; aside from some minor edge wear, these books are pristine) and the bonus of the included dice that compelled me to bid on this auction. Truly, happiness - for me - is an old set of polyhedral dice. The first set that came with my Moldvay D&D Basic set were red. I still have three of them. I also have one from a pale blue set from another Moldvay basic box. I never bought the Expert box, just the rulebook and module on their own. The die I have that are in the roughest shape however are the ones from my first edition Gamma World box. They sat in the box untouched for about 20 years, and then saw heavy play for three months. By the end of the three months, they had no discernable edges left. I scored a Holmes box with the original dice, and B1. --I am so very eagerly awaiting that. @DYson: I never owned the Expert rules back in the day - we moved very quickly from Basic to Advanced. It's kind of unfortunate, really, since I think the Basic and Expert rules together make a great rules set. Best part is you (almost -d8) got doubles, too! I have a few sets of those and some stragglers from other sets too. I used a tan set back in..err...'81-83, but also mixed in a clear set (diamond) of the precision variety right after that. I personally currently prefer the precision edge (Gamescience, etc) sets, and as I noted at GeekOrthodox in Reis' post comments, I tend to swap sets depending on which character I'm playing that session, or sometimes which mood I might be in that day. Weird? Yes. Do I care? Nope. As far as the dice you just scored, I think my current full sets are tan, light blue, olive green, and yellow. Then I have some more yellows, reds, blues, etc..just not in full sets. If I can scrounge up a yellow d8, I'll roll it your way, ok? To complete your double set there. I like dice new and old. Just bought a couple sets for no particular reason, including a completely blank polyhedral set. But I also like some of the really old ones. My original Holmes Basic Set had no dice, only the laminated chits. (I sure wish I'd saved those somewhere.) But I soon found and bought what I think are the original TSR dice: these. I eventually added a Gamescience d20 and those were my dice for years. If you say "old school dice", those are the ones I think of. Gamers love dice. We ran an article exploring dice rituals and superstitions a while back and it still gets a lot of traffic. One thing we didn't look at is dice nostalgia. Great addition to the never-ending dice discussion. We have two long-lived rituals: "Show Me a 20" (essentially the same as your "Show Me a 1" rule, just in reverse) and "Spank That Bad Boy" (holding the die with the desired number facing up and smacking it twice against the table before rolling - maybe subconsciously believing that doing so will shift the die's center of gravity to the opposite side of the number you want to roll; or maybe just to let it know who's boss :P). 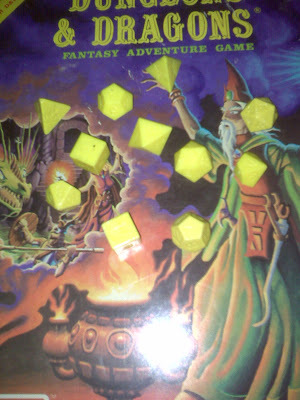 The dice that came with my Moldvay set were yellow plastic. The dice that came with my Cook expert set were blue plastic. Most of these were lost or eaten by the family cocker spaniel over the years, but I still retain a couple, including my original Moldvay 20-sider and 6-sider. These dice consistently roll high...the 6 sider just rolls a lot 5s and 6s, but mostly 6s. The 20 sider tends to roll 18s+ though more 20s than any other number. No idea why, though they're pretty worn from the years. I love the very faint "chitter-chitter-chitter" when rolling these dice made of the cheap plastic. The "clatter-clatter-clatter" of quality dice just isn't the same.